The United States is in the midst of an opioid addiction crisis. How big is this problem? Forty-four people in the United States die every day from prescription opioid overdose; the number increases to 78 every day when we include heroin. Almost 7,000 people are treated in emergency rooms in the United States every day for misuse of a prescription opioid. In 2010, one in 20 people over the age of 12 used opioid medications non-medically or had used it other than as prescribed. Between 1999 and 2010, the sales of prescription opioids quadrupled, and so did the rate of opioid overdose deaths. Enough opioids were prescribed in 2010 to give a one-month supply of 5mg of hydrocodone every four hours to every adult in the United States. And since then the problem has only gotten worse. One in three prescriptions filled for opioids are currently being abused. The estimated cost of opioid abuse is $56 billion per year. Baby boomers are four times more likely to abuse opioids than millennials. In terms of geography, the states with the worst opioid addiction problem are in the South. But Maine is following closely behind in rates of opioid prescriptions that are filled. While America claims only 5 percent of the world’s population, we consume 80 percent of the world’s opioids. We’re using opioids far more than any other country — to the extent that some countries actually have trouble accessing opioids for important reasons like post-surgical or end-of-life treatment. Analgesia can be hard to come by in some Third World countries — while we’re using it all up. In the United States, nearly 50 percent of people who take opioids for more than 30 days in the first year continue to use opioids for three years or longer. Half of them are being prescribed short-acting opioids, the type that Big Pharma opioid manufacturers say is more likely to lead to addiction and abuse. Nearly 60 percent of U.S. patients are taking opiates in combination with other drugs that are known to make the opioids more dangerous, to make an overdose more likely. Prescription opioid abuse and addiction is actually a much bigger problem than heroin addiction in this country. In 2014, for example, there were around 19,000 overdose deaths from opioid prescriptions and around 11,000 overdose deaths from heroin. Many of these heroin users started with prescription opioids. That year in Maine, where I practice medicine, sixty-nine percent of drug overdose deaths were caused by a prescribed opioid. Maine had the highest per capita prescription rate of long-acting opioids in the United States – more than double the national average. Maine had the most long-term opioids prescribed per capita. It’s a nationwide problem. Nearly 80 percent of heroin users in the United States reported using prescription opioids before initiating heroin use. And 45 percent of heroin users are currently addicted to prescription opioids. So this problem is largely starting in the doctor’s office. When a doctor is face-to-face with a chronic pain patient who says, “My pain is worse, the opioids aren’t working, I need more. If I don’t get them I’m not going to be able to go to work, I’m not going to be able to support my family, I’m not going to be able to function” – it’s hard for that clinician to say no, because they don’t have another tool. Well, in some states with medical cannabis laws, physicians do have other treatment options. But many doctors aren’t aware of this. As a clinician, I see many people suffering with chronic pain and, like other physicians, I want to do something to help them. Fortunately, I have an alternative. I have an option that I know is safe and effective in the treatment of chronic pain. Adding cannabis to opioids makes the opioids safer. Cannabis can prevent opioid tolerance building and the need for dose escalation. Cannabis can treat the symptoms of opioid withdrawal. And cannabis is safer than other harm reduction options for people that are addicted or dependent on opioids. We’re prescribing so many opioids and consuming so many opioids – but to what extent do these pharmaceuticals actually help with chronic pain? A 2015 review from the Annals of Internal Medicine summarized, “Evidence is insufficient to determine the effectiveness of long-term opioid therapy for improving chronic pain in function.” This review analyzed 34 studies on adult chronic pain patients who were using opioids for more than three months. The authors of this review were unable to find a single study that assessed outcomes after one year related to pain, function, or quality of life. There were no studies that compared opioid use for more than a year to placebo or compared opioids to non-opioid treatments or to no therapy. The article in the Annals of Internal Medicine found no evidence supporting the use of long-term opioids as an effective treatment modality. But the authors did find an increased risk of serious harm associated with long-term opioid use – overdose, fractures, heart attacks, sexual dysfunction. In contrast, the American Academy of Neurology reported in 2014 that an oral cannabis extract can be used to treat chronic neuropathic pain in multiple sclerosis with the highest level of evidence. This is a very particular group of neurologists that rate their evidence on a scale from A to D, and they got category A evidence for the cannabis extract. There have been extensive scientific, randomized controlled trials showing that cannabis oil extract can effectively treat chronic pain. How do cannabis and opioids work together? What are we seeing in the clinic and how can we explain what we’re seeing? Opioid and cannabinoid receptors are both present in pain areas of the brain. Receptors can be thought of as keyholes. 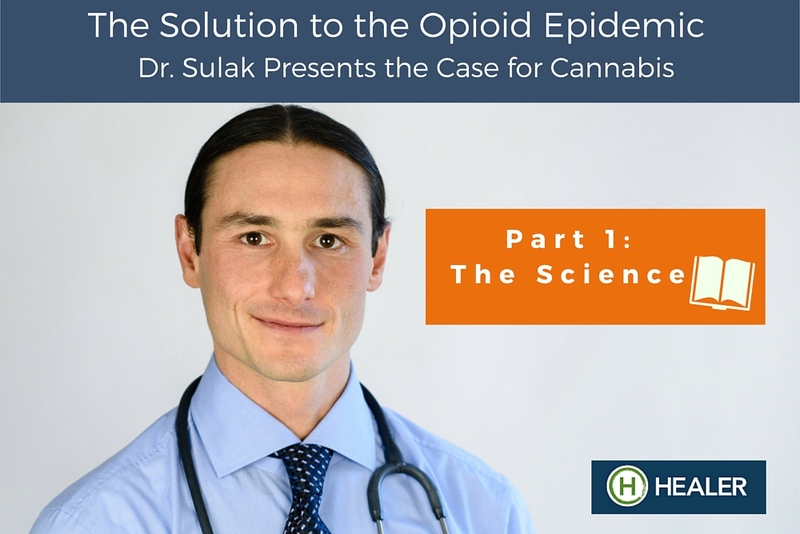 And when the drug – the cannabinoid or the opioid – comes in, it fits into the receptor and it has some effect on the cell, changing its physiology. Opioid and cannabinoid receptors are also both present in other areas of the brain that have to do with addiction and behavior. We know that these receptors talk to each other. And researchers have found that administering opioids and cannabis together results in a greater-than-additive anti-pain effect. Using cannabinoids and opioids in combination results in a synergistic reduction of pain. There’s peer-reviewed animal research as well as human data to support this. Dr. Donald Abrams treated 21 patients in a hospital setting who were using opioids for chronic pain in quite high doses, and they received cannabis from the National Institute of Drug Abuse, at 3.56 percent THC. For anyone that’s familiar with cannabis potencies, that’s incredibly low potency cannabis. (It would probably be hard to find cannabis with that low a potency, even if you looked for it.) The patients were vaporizing the cannabis three times daily, and their pain significantly decreased by 27 percent. Perhaps if they used a better preparation of cannabis and a more suitable delivery method, they would have gotten even better results than what Dr. Abrams reported in 2011. Can cannabis be used to replace opioids in chronic pain patients? It can certainly be used to enhance the effects of the opioids. A 2016 study surveyed 244 medical cannabis patients in Michigan, where medical cannabis use was associated with an overall 64 percent decrease in opioid use, a decrease in the number and side effects of other medications, and a 45 percent improvement in quality of life. An Israeli study from the same year found that 44 percent of 176 opioid-using patients were able to discontinue opioid therapy entirely seven months after they began smoking cannabis or eating cannabis-infused cookies. They had been given titration instructions — basically start low and gradually increase the amount of cannabis consumed each day. So, yes, cannabis can be used to replace opioids. But is it safe to use them together? Consider the ratio of the fatal dose to the effective dose of various medications. Heroin has a very narrow therapeutic index. If you were to take five times the dose of heroin that you can use to relieve pain, it could kill you. If you were to take 10 times the dose of alcohol that might get you a little bit relaxed, that dose could kill you. But there’s no lethal dose of cannabis. So what happens when we use cannabis and opioids together? Well, the problem with using too many opioids is that they stimulate opioid receptors in the cardio-respiratory centers of the brain, which can be fatal. This is the part of the brain that controls your heart rate and your breathing. There are virtually no cannabinoid receptors present in these areas of the brain, whereas in the pain areas of the brain there’s a lot of cannabinoid and opioid interactions. This is key: By adding cannabinoids to opioids, we actually get a widening of the therapeutic index. The lethal dose stays the same, but the effective dose goes way down because cannabis potentiates the opiates. So now we’re playing in a much safer range. How about retention of efficacy? One of the biggest problems with long-term opioid treatment is that it stops working. People build up tolerance to opioids, they come back every three to six months saying, ‘I want more, I need more.’ I saw this in my medical training, especially during residency. It was kind of the bane of the primary care provider’s existence. What to do about these patients that we don’t have a better solution for. And every once in a while I’d see a patient that came in on a stable dose of opioids that never asked for an increase – maybe 5mg of oxycodone three times a day for a decade. No change in dosage. So I started to wonder, and I asked why are these patients so different from all the other patients that are taking opioids. I asked the patients and they told me that they were using cannabis in combination with the opioids, that it made the opioids more powerful, the cannabis made it so that these patients didn’t need more. Once again, there’s solid science behind this. It’s been shown in mice that opioid receptors are actually up-regulated in animals that are treated with both morphine and THC (the main psychoactive component of cannabis). This is the opposite of what happens when they’re treated with morphine alone. The mice are able to avoid building tolerance and retain the anti-pain effects of the morphine even when they were given a low dose of THC — a dose so low that on it’s own it wouldn’t relieve pain. But that tiny dose is enough to preserve and potentiate the function of the morphine. While we would like to imagine that everyone who’s addicted to any substance could successfully get off substances all together, we recognize that that’s not practical. Abstinence just doesn’t work for everyone. So instead of focusing on abstinence, we take a safer substance and use it to replace a more harmful substance. This is the practice of harm reduction. What are our current harm reduction options for treating opioids? Two main harm reduction approaches for opioids are accepted in mainstream medicine right now. One is Buprenorphine which, when combined with an opioid blocking drug called Naloxone, is sold as Suboxone. And we also have Methadone, although it’s debatable whether Methadone is safer than heroin. A 2014 review in the Cochrane Database assessed the efficacy of these approved heroin substation options and found that only high-dose Buprenorphine was more effective than placebo in suppressing illicit opioid use. Low dose and medium dose Buprenorphine in trials did not suppress the opioids better than placebo. Methadone maintenance was found to be superior to Buprenorphine in retaining people in treatment. Sometimes these treatments can help, but they’re not enough. We need something more. So what about cannabis? First of all, cannabis has a much better safety profile than Methadone or Suboxone. There’s no lethal overdose with cannabis. You can have a fatal overdose on Methadone; the same for Suboxone, especially if you’re taking it with a Benzo (like Valium or Clonazepam) or another agent that suppresses cardiorespiratory function. Yet these drugs are often prescribed together. Cannabis, by comparison, has a lower risk of dependence than any other psychoactive substance. It also has a low risk for abuse and diversion, especially in non-smokable forms. There’s currently over 30,000 patient years of data, mostly in randomized control trials using a cannabis extract, a sublingual spray called Nabiximols, usually tested for the treatment of pain and spasticity. It’s already approved in 27 countries. In that huge data set, there’s been no evidence of abuse or diversion. That’s really impressive. What’s more, most people who stop using cannabis are able to do so without any formal treatment. In 2014, the Journal of the American Medical Association published a study that looked at various interventions to address the opioid problem, to see how many opioid overdose deaths these interventions could prevent. Some states have implemented a prescription drug monitoring program so medical providers can log in, look up a patient, and find out which controlled substances they’ve been prescribed, where and when they filled them, how many pills they got, and so forth. But implementing such monitoring program did not have any significant effect on reducing opioid overdose deaths. Increased state oversight of pain management clinics had no significant effect. But simply passing a state medical cannabis law on average reduced opioid overdose deaths by 24.8 percent. What’s more, the AMA article reported that each year after the medical cannabis law was passed, the rate of opioid overdose deaths continued to decrease. What’s going on here? It doesn’t make any sense. It’s well documented that cannabis is a good replacement for illegal and prescription drugs. There is a Canadian survey of 473 medical cannabis patients, 87 percent of them were using cannabis as a substitute for something else — prescription drugs, illicit drugs, or alcohol. Eighty percent reported substituting for prescription drugs; 51 for alcohol; 32 percent for illicit substances. And the reasons they gave were consistent: more effective, less side effects, less risk of dependence and addiction. Cannabis has been shown to improve Naltrexone treatment retention. Naltrexone is an opioid blocking drug. If a person takes Naltrexone, they’re going to be less tempted, hopefully, to abuse opioids because the opioids aren’t going to do anything to them when they take them. A 2009 study found that intermittent cannabis users were staying in that treatment program for 113 days, on average, compared to abstinent users – people who weren’t using cannabis at all – who only lasted 47 days. They also found that intensive behavioral therapy helped those who also used cannabis, but didn’t help the non-cannabis users at all. Cannabis does something to help patients stay in recovery, to stay out of that addictive chapter of their life and to move on to something new. There’s evidence elsewhere in the scientific literature that suggests cannabinoids can promote neuroplastic changes in the brain, changes literally in the structure of the brain related to new behavior, new thought patterns. That’s exactly what we need to get someone out of that addictive cycle into a new phase of life. In addition to keeping people in treatment, replacing and reducing the opioids, improving the pain relief that opioids provide, and preventing opioid dose escalation and tolerance, cannabis can also treat the symptoms of opioid withdrawal: nausea, vomiting, diarrhea, abdominal cramping, muscle spasms, anxiety, agitation, restlessness, insomnia, and also minor symptoms like runny nose and sweating. Cannabis can treat all of these withdrawal symptoms. In residency, I learned about a 4-drug cocktail – a muscle relaxant, an anti-hypertensive agent, a diarrhea agent, an anti-nausea agent – we used them all together to get someone through withdrawal, four pharmaceuticals each with their own safety issues. But with cannabis we have a non-lethal herb that can do all of that. Cannabis users experience decreased opioid withdrawal severity. People often ask, what about the gateway theory? What about getting addicted to cannabis? Aren’t we just replacing one addiction with another? Well, we’ve already discussed harm reduction, but let’s look at how addictive cannabis actually is. According to the National Institute of Drug Abuse, lifetime risk for dependence on cannabis is 9 percent. That’s less than alcohol, opiates or any other drugs of abuse. But that 9 percent figure is exaggerated; it includes people who were in court-mandated treatment programs. Quite a few people who get busted for cannabis are not addicted to it; they’re using it recreationally, or even medically, and because of their legal issues they end up in drug treatment. That skews the numbers. Indeed, abruptly ceasing chronic cannabis use can cause withdrawal symptoms. People can become dependent on it. Cannabis withdrawal symptoms include irritability, nervousness, anxiety, anger or aggression, decreased appetite, weight loss, restlessness, sleep difficulty, strange dreams. Symptoms appear one to two days after stopping chronic cannabis use and last at most two weeks. But our patients consistently report that cannabis withdrawal is relatively mild, very similar to caffeine withdrawal. A 2015 study from the Journal of American Medical Association looked at the data of actual medical cannabis instead of illicit cannabis. Indeed, medical cannabis can have unwanted side effects. But these side effects were typically quite mild and they can be mediated by dosage. So when you use programs like healer.wpengine.com/programs or when you have a cannabis clinician who knows what they’re doing, they can walk you through how to use cannabis and get the right dosage. It’s possible to use cannabis without any side effects at all. Many of our patients do that. The whole conversation around cannabis side effects, cannabis addiction and dependence changes quite a bit with the emergence of CBD-rich cannabis. During the decades of prohibition, cannabis breeders grew strains that had more and more THC (The High Causer) and less and less of the sister cannabinoids because that’s what sells on the black market. People want to buy something that’s pleasantly intoxicating. But recently there’s been a shift, a complete reversal, where people who are medical patients want serious symptom relief, they want the medical benefits, but many people don’t want to get high or impaired. Significant medical benefits are attributed to a non-intoxicating sister molecule of THC called CBD or cannabidiol. CBD has been shown to reduce the side effects caused by THC and to enhance the benefits of THC. In some animal studies, CBD has been shown to decrease addictive behavior; medical scientists found that the heroin-seeking behavior of self-administering rats decreased when the animals were given CBD. While CBD is generating a lot of excitement and hope within the medical community, concerns persist about how medical cannabis laws might impact young people. If we pass medical cannabis or adult-use legalization, aren’t more adolescents going to start smoking marijuana? If they perceive cannabis as safe, aren’t they’re going to get into it at a younger age? Integr8 Health, my clinic, recently sent a survey to all of our patients and everyone that was one our mailing list. The survey asked basic questions about whether or not they had used opioids for more than three months, if they used the opioids in combination with cannabis, and what happened when they did. We had over 1,000 responders, 48 percent female. Seventy percent of people who responded had used opioids for more than three months in a row. Fifty percent of responders had used medical cannabis in combination with their opioids. Of these, 39 percent had stopped using opioids completely after starting cannabis; 73 percent had sustained the reduction of opioids for over a year; and an additional 39 percent had reduced their dose, but were continuing to use opioids. That’s big. Thirty-nine percent off opioids entirely and another 39 percent reduced their dose. Forty-seven percent reported a reduction in pain greater than 40 percent. Finding a medication that can reduce pain more than 40 percent – that’s considered very effective in the medical literature. Eighty percent reported improved function; and 87 percent reported improvement in their quality of life. Luckily in Maine and in other states where medical cannabis is legal, patients with chronic pain have a choice. Cannabis can help them. But there are a lot of people who are dependent on opioids and addicted to opioids who can’t legally access cannabis because medical marijuana isn’t allowed in their state or their state doesn’t include chronic pain or opioid addiction among the conditions for which a physician can recommend cannabis. States with medical marijuana laws should add opioid addiction to the list of conditions that can be treated with cannabis. And states that have yet to recognize the medical utility of cannabis should revise and update their policy given the extent of the opioid crisis and the considerable scientific and clinical data that highlights the potential of cannabis as a lifesaving treatment for opiate addiction. Medical cannabis should be a first-line treatment for opioid addiction, not a last resort if it’s permitted at all. In summary, the opioid problem is lethal and growing. Prescription opioid abuse is actually worse than heroin abuse; it’s a bigger problem, and it starts in the doctor’s office. Cannabis can replace and reduce opioid use. Adding cannabis makes opioids safer by widening the therapeutic index. Cannabis can prevent opioid tolerance-building and the need for dose escalation. And cannabis can treat the symptoms of opioid withdrawal. Finally, cannabis is safer than the other harm reduction options. *Forty-four people die every day from prescription opioid overdose in America. Almost 7,000 people are treated in emergency rooms in the United States every day for misuse of a prescription opioid. *Prescription opioid abuse is actually worse than heroin abuse. In 2014, there were around 19,000 overdose deaths from opioid prescriptions and around 11,000 overdose deaths from heroin. Nearly 80 percent of heroin users in the United States reported using prescription opioids before initiating heroin use. *States with medical cannabis laws on average reduced opioid overdose deaths by 24.8 percent. And each year after the medical cannabis law was passed, the rate of opioid overdose deaths continued to decrease, according to a report in the Journal of the American Medical Association. *Extensive scientific, randomized controlled trials have shown that a cannabis oil extract can be an effective treatment for chronic neuropathic pain. *Cannabis improves the pain relief that opioids provide. Medical scientists have found that administering opioids and cannabis together results in a greater-than-additive anti-pain effect, a synergistic reduction of pain. *Cannabis makes opioid therapy safer by widening the therapeutic index so that a patient needs less opioids to get a strong analgesic effect. *Cannabis can prevent opioid tolerance building and the need for dose escalation. *Cannabis can treat the symptoms of opioid withdrawal — nausea, vomiting, spasms, cramping, insomnia. Cannabis users experience decreased opioid withdrawal severity. *Cannabis can replace and reduce the use of opioids and other substances. Many patients use cannabis as a substitute for prescription drugs, illicit drugs, or alcohol. *Cannabis therapy is safer than the other harm reduction options. Abrams D, et al, “Cannabinoid-opioid interaction in chronic pain,” Clin Pharmacol Ther, Epub 2011 Nov 2. Bachhuber, Marcus A, et al, “Medical Cannabis Laws and Opioid Analgesic Overdose Mortality in the United States, 1999-2010,” JAMA Intern Med, 2014 Oct.
Boehnke KF, et al, “Medical Cannabis Use is Associated With Decreased Opiate Medication in a Retrospective Cross-Sectional Survey of Patients with Chronic Pain,” J Pain, 2016 Jun. Chou, Roger, et al, “The Effectiveness and Risks of Long-Term Opioid Therapy for Chronic Pain: A Systematic Review for a National Institutes of Health Pathways to Prevention Workshop,” Annals of Internal Medicine, 17 February 2015. Haroutounian S, et al, “The Effect of Medicinal Cannabis on Pain and Quality of Life Outcomes in Chronic Pain: A Prospective Open-label Study,” Clin J Pain, 2016 Feb 17. Hasin, Deborah S, et al, “Medical marijuana laws and adolescent marijuana use in the USA from 1991 to 2014: results from annual, repeated, cross-sectional surveys,” The LANCET Psychiatry, July 2015. Koppel BS, et al, “Systematic review: efficacy and safety of medical marijuana in selected neurological disorders: report of the Guideline Development Subcommittee of the American Academy of Neurology,” Neurology, 2014 April 29. Lucas, Philippe, et al, “Substituting cannabis for prescription drugs, alcohol and other substances among medical cannabis patients: The impact of contextual factors,” Drug and Alcohol Review, 14 Sept 2015. Mattick RP, et al, “Buprenorphine maintenance versus placebo or methadone maintenance for opioid dependence,” Cochrane Database Syst Rev, 2014 Feb 6. Raby WN, et al, “Intermittent marijuana use is associated with improved treatment retention in naltrexone treatment for opiate-dependence,” Am J Addict, 2009 Jul-Aug.
Wall MM, et al, “Prevalence of marijuana use does not differentially increase among youth after states pass medical marijuana laws: Commentary on and reanalysis of US National Survey on Drug Use in Households data 2002-2011,” Intl J Drug Policy, 2016 Mar. Whiting PF, et al, “Cannabinoids for Medical Use: A Systematic Review and Meta-analysis,” JAMA, 2015 Jun 23-30.